From February through May 2009, I participated in the Envirotech program, offered through Ball State University and coordinated by Mary Annette Rose. This page documents the project development and classroom-based guided inquiry process I created for the program. 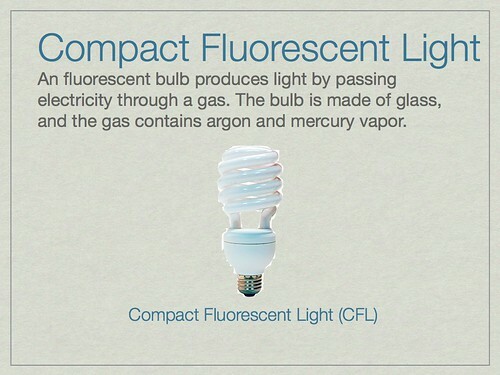 How might replacing incandescent lamps with compact fluorescent lamps (CFL) impact the environment and society? What strategies might individuals and communities use to reduce the negative impacts of replacing incandescents with CFLs? For my project, I worked with two mixed-level classes, each containing a mixture of 4th and 5th grade students. These classes were in the middle of a unit focused on Green Design, and the Envirotech activity served as the capstone experience for the unit. Questions 1-3 were given a continuum of “Agree, Don’t Know, Disagree”. The most common #1 choice was Energy Efficiency (13). The most common #2 choice was Non-Toxic (11). The most common #3 choice was Price (11). Questions 5 & 6 asked multiple choice questions. I organized the project into 3 sessions. For each session, I team-taught with our 4th/5th grade science teacher. Lessons were organized using the scientific method as a familiar framework for exploring the question “Which light bulb do you choose to buy for the house?”. 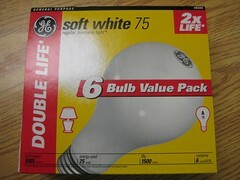 At Station One, students gathered information from the light bulb packaging. They were responsible for finding out the Energy Used (Watts), Light Output (Lumens), and Life (Hours) for each type of bulb. 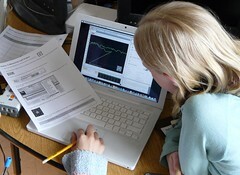 At Station Two, students measured electricity usage & heat produced by the different types of bulb. To measure the electricity usage, a pan light with a CFL and another pan light with an incandescent were each plugged into a Kill A Watt meter and left on for the same duration of time while students were measuring temperature. To measure heat production, students did two simple experiments. Put your hand under the light about 1 foot away from the bulb. What do you observe? 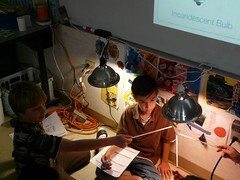 Students performed this observation for both types of bulbs. The second experiment saw students using thermometers to measure the temperature difference between the two types of bulbs. 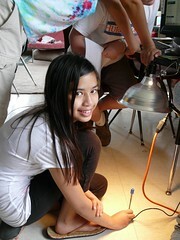 At Station Three, students measured the light output from both types of bulbs. Two pan lights were set up, one with a 75 watt-equivalent CFL, and another with a 75 watt incandescent. This experiment was performed using the Lego NXT v2.0 software, a Lego NXT brick, a Vernier Light Sensor, and a Vernier-NXT sensor adapter. 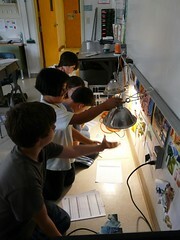 Students measured the light output for each type of bulb and recorded their data. After the unit was finished, students participated in two final activities. Based on their research and inquiry experiment, students wrote a short paper describing which light bulb they would choose and why they would make that choice. The quality of student writing was quite high, and their choices and reasons varied widely. 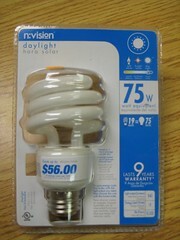 Many students chose CFLs, citing their long life, energy efficiency, and a general “good for the environment” factor. However, a number of students chose incandescent bulbs for their dream house, citing factors of price and non-toxic materials. I was quite pleased to see the range of thoughtful responses, which indicated to me that the students had really engaged with the topic at hand and were not just parroting what they expected the teacher to want to hear. In addition to writing their position paper, students took a post-assessment asking the same 6 questions as the pre-test. 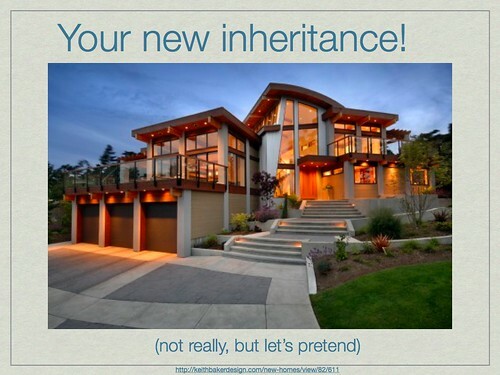 What was striking about this was the lack of change in student knowledge and attitudes. In fact, only two questions had any significant variation from the pre-test. 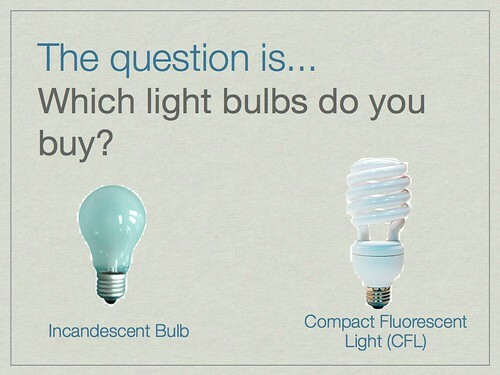 Question 4 asked, “If you were going to buy a light bulb for your bedroom, which of the following things would be the most important to you?”. The top two factors were still the same as before (Energy Efficiency (15), and Non-Toxic (11)), but the most common #3 factor was now Long Life (11), where it had previously been Price. Question 6 also showed a significant change. It asked, “If a fluorescent lamp quit working, what would you do with the spent bulb or tube?”. This time, 17/40 chose the correct answer, “Take it to a hazardous waste collection site”. Originally, only 7 students answered this correctly, with the majority choosing “Recycle it, like aluminum cans”. You can view the full pre- and post-test data (presented in aggregate only). You may also view the pre-test and post-tests. Many thanks to Mary Annette Rose and Susan Londt from Ball State University for inviting me to be part of this program. Also, thanks to Johnny Thompson from Honey Creek for allowing me to use part of her science time with the 4th & 5th grade classes to run this project.